Thank you very much for such a professional and friendly way in which you conducted your services, it was excellent and worth every penny! We have no hesitation in recommending you to anyone unsure of whether you could make a difference - because you certainly did! Even as a normally well organised person I'm not sure I could have coped without you! Perhaps in the near future we might need you for a Christening! Just a note to say a formal thank you for making our fabulous wedding day so spectacular! We have had the photos back, they only serve to illustrate what a wonderfully warm occasion it was. We were so impressed by how well organised and perfect everything was - thanks to the staff at Samlesbury and your ability to stay one step ahead Howard! Thank you do much for everything you did on our special day, you really helped us to relax and enjoy it all with your professionalism. We think it was the best wedding we've been to!!!! Thanks, Alison & Andrew; Mr & Mrs Lambie-Damer! Now that Victoria and Jon have returned from their honeymoon and Richard and I have been relieved of our full-time babysitting duties, I am at last able to find time to write my thank you letters. One of the biggest thank yous must go to you, Howard, for all you did to help make Victoria and Jon's wedding day so special. 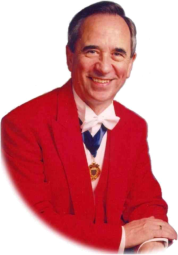 Jon, who (to say the least) had been very sceptical about the need to employ a toastmaster, turned to me during the reception meal and said: "I take it all back, I was wrong, I don't know how we would have managed without Howard." We valued the very professional way in which you conducted the events of the day and the seamless way in which you made everything happen. We were especially grateful for you stepping in to help with the front-of-house duties at very short notice when one of the venue coordinators was taken ill. There were problems you sorted out before they escalated - not least of which was acting as mediator when certain band-members were having a few 'diva moments' - but you handled things so discreetly that I'm sure none of the guests were aware of them. On a personal note, as mother-of-the-bride, having spent so long planning and agonising over the arrangements for the wedding, I was so grateful to be able to hand things over to you and relax while you made it all happen. Please accept my apologies for the lateness of this message. 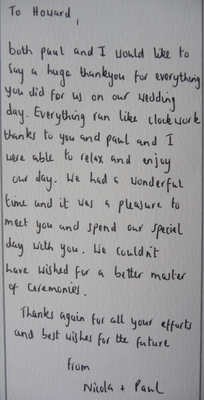 Claire and I wanted to thankyou so much for the fabulous job you did at our wedding on 21st of May at Samlesbury Hall. We had a truly fantastic day and it wouldn't have been the big success it was without your help. You managed to organise the whole day in such a professional and unobtrusive way and we couldn't have asked for a better MC. Both Paul and I would like to say a huge thankyou for everything you did for us on our wedding day. Everything ran like clockwork thanks to you, and Paul I were able to relax and enjoy our day. We had a wonderful time and it was a pleasure to meet you and spend our special day with you. We couldn't have wished for a better master of ceremonies. Just a quick note to express our sincere gratitude for helping to make our day so special. Your professionalism and efficiency combined with your genuine desire to make our day run as smoothly as possible and ensure we had a truly perfect wedding day was something that was strongly apparent and which myself and Elizabeth greatly appreciated. The service that you provide is second to none which I'm sure is the response you get each and every time you do such a fine job to help make two persons happiest day so perfect. On our return from the Maldives we will forward you some photos of our day. We are writing to thank you for helping to make our wedding day so special. 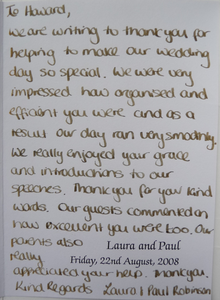 We were very impressed how organised and efficient you were, and as a result our day ran very smoothly. We really enjoyed your grace and introductions to our speeches; thank you for your kind words. Our guests commented on how excellent you were, too. Our parents also really appreciated your help, thank you. Well, we have just returned from Spain, and the newly-weds have just arrived back from a wonderful honeymoon in Alaska. I am writing this to thank you for making Zoe and Sam's wedding day so special. They had a wonderful time and thanks to you, I was able to relax and enjoy the day as well. Something I did not expect to be able to do. Your style is friendly, and very professional, without being bossy. Having seen toastmasters at other weddings I really do know we were lucky to have found you. Thanks again for your hard work and professionalism. I am just sending you this email to say many, many thanks for your kind help and assistance at our wedding. I sincerely hope you enjoyed yourself as much as we did. Thank you for helping to make our day so special, you were fantastic! Our memories of the day are that it couldn't have been better and will stay with us forever. 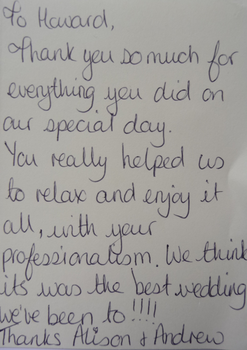 We wish to express our sincere gratitude for helping to make our daughter Emma's wedding day so special. Your co-ordination of the day's events were very professional and ensured that everything ran smoothly. 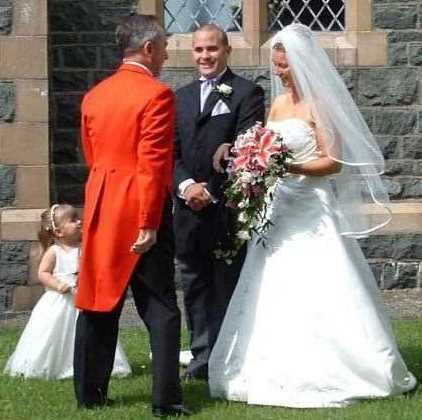 Your services helped to make a special day even more special and relaxed. We would have no hesitation in recommending your wonderful service. We are back from our honeymoon which was really relaxing, just what we needed after all the stressful wedding planning. 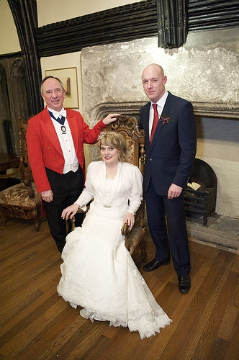 Before the wedding we were debating whether or not to have a toastmaster. We thought it was an unnecessary expense and as such we only booked you a couple of weeks before the wedding. Now, after the wedding, we realise that it was the best value for money we spent on the whole wedding. You were worth at least twice the price! Without your services the wedding day wouldn't have been what it was. You really put us at ease and helped us enormously; you took all the stress away from us and made the whole day run very smoothly. We feel that you went above and beyond the call of duty and we are very grateful for everything you did. We found that you have the perfect temperament for your job; you have a very calming yet authoritative demeanour, which is perfect for such potentially stessful occasions. You really are a thoroughly lovely man. We have no hesitation in recommending you to everyone. You are by far the best MC we have ever seen and everyone at the wedding thought so as well. We really could not have done it without you. I just wanted to drop you a line to say a big thank you for all your hard work at Kim & Christians wedding on Friday; everyone was very impressed with your professionalism and decorum. I really don’t know what we would have done without you and anyone planning a wedding without a professional Toastmaster as yourself should think again. I’m sure Kim will want to communicate her thoughts to you personally when she returns from honeymoon and gets herself together so I will leave her to do that. Thanks again for making our day so stress free and fluid. I would like to take this opportunity to thank you, from my wife, Jenny, and I, on behalf of our Daughter, Caroline, and her husband, Kevin, for making their wedding such a smooth running event. I am sure most of what you did was invisible to all the guest, us included, as it all seemed to flow so easily but I am certain that this was totally due to you organisational skills. The whole event, from start to finish, went without a hitch and without any visible panics or untoward difficulties. You also shouldered all the organisational responsibilities which eased the situation for the Samlesbury Hall people and took all the load off us as parents of the bride. I am sure that it was due to your actions that we were both able to fully relax and enjoy the whole day. I will recommend you to everyone I know who will be going through a major event, whether it be wedding, or other ceremony, or get-together. Thank you for your excellent service and best regards for the future. Whether your wedding is next week or next year, why not ask Howard about his availability; ask him for a quote; or just ask him more about his services using the contact form below.